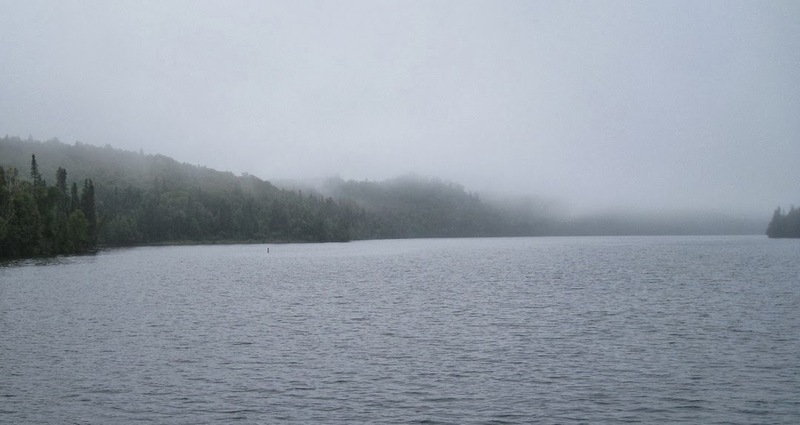 We awoke on day four to a grey sky and fog encroaching on the bay and obscuring the trees across the water. If we were lucky, it would just remain foggy. If not, we were in for a rainy day. Our plan was to hike to South Lake Desor today. Just under ten miles away, Lake Desor is rumored to be a nice place to camp, with tent sites above the shore of the lake. Because it is tent-only, we thought about this likely scenario: hiking in the rain, arriving in the rain, setting up camp in the rain, and being unable to dry out. Dealing with rain is part of the experience, but we had left ourselves open to itinerary changes and we considered all of our options. We had an extra day worked into our schedule, so we could stay one more day at Siskiwit Bay and wait out the weather, or we could also hike to Washington Creek. Washington Creek is the campground at Windigo, and it has several shelters. Siskiwit Bay is great, but I didn't feel like spending a third day there. We wanted to see Lake Desor, but it wouldn't be the worst thing to skip it in favor of a shelter at Washington Creek given the weather outlook. It was a difficult decision to make, but we decided to pass on Lake Desor. This meant we would be completing the Feldtmann Loop a day early. Washington Creek is 11 miles from Siskiwit Bay. We had spent so much time thinking about what we were going to do that we didn't leave until 11:45 am. This is a very late start, and we had a long hike in front of us. It was cold, so we put our rain jackets on for warmth and also as a weather precaution before heading out. Backtracking to the spot where the Feldtmann Ridge Trail ends, we set off on Island Mine Trail, which begins at Siskiwit Bay and runs north to the Greenstone Ridge. Island Mine Trail follows the edge of Siskiwit Bay for about 1 ½ miles and crosses the Big Siskiwit River by footbridge. The trail is technically inside the brush just off the beach, but it is possible to hike on the beach itself for much of the way. We walked on the beach as far as we could, but eventually had to return to the trail. The underbrush was so wet from the fog that we were quickly soaked from the waist down. We should have known better and worn our rain pants from the start. We detoured onto a rocky stretch of beach in order to put our gear down and put on rain pants. During this time, a small National Park Service boat emerged from the fog out in the bay. As we balanced on the rocks, trying to get our rain pants on while refusing to take our boots off, we watched two park rangers put a canoe into the water from the boat. 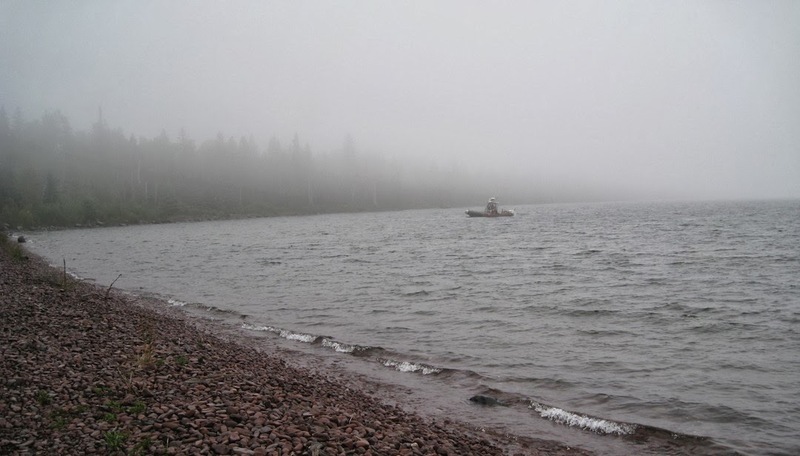 One person paddled to shore, where another walked out to meet him and got in the canoe. At first, we thought that they might be in the process of performing a rescue. Maybe a hiker slipped in the wet conditions and had been injured, and the park service had been notified. After a few minutes, this didn't appear to be the case, but given that it was not great weather to be on the water, they must have been up to official business of some kind as they paddled across the bay. It is unlikely they were out there for fun. (Do park ranges have time to do things for fun? Probably not.) They saw us watching them and waved, which made me feel bad for gawking. The rocks along this section of shore are amazing. I picked up stone after stone and examined them while Craig finished getting his gear in order. Mostly red and all approximately the same size, some rocks were filled with fossils and crystals, while others were conglomerates containing pieces of other rocks that had been fused together over time. It began raining while we were on the beach, and it didn't stop for the rest of the day. Hiking in the rain can be fun at times, but the novelty wears off after a while. By the end of the first hour, we had enough of it. Island Mine Trail leaves the beach and turns inland where it follows the path of what had been a wagon road in the 1870s leading to Island Mine, where copper was sought after. There are no views during this two-mile stretch, and there is more of the tall vegetation to contend with. Most of the hiking on IMT was easy, and we were able to maintain a good pace without taking too many breaks. Unfortunately, because it was raining so much, I had to keep my camera tucked away, and we didn't do any exploring in the area of the mine. We saw an old well, but we didn't see the old steam engine that remains in the woods, or any other parts of the mine itself. It was wet and muddy, and we had a long way to go after getting such a late start. We ate lunch in a cedar swamp, which had enough of a canopy overhead that it kept us from getting rained on too much. Aside from the section that follows the old wagon road, IMT is an interesting trail. It is unfortunate that it was raining so heavily; we were more focussed on getting through it without slipping in the mud or on wet rocks and tree roots than looking at the environment around us. Parts of the trail are somewhat rugged, with one steep climb and a few switchbacks, and it crosses a stream just before reaching Island Mine Campground. We reached the Greenstone Ridge shortly after passing through the campground, where a group of three hikers huddled under a tarp out of the rain. We couldn't tell if they were camping there, or if they had just stopped for a break and wanted to get out of the rain for a little while. From the trail intersection, we turned west; we had gone about five miles and had six more to go. This stretch of the Greenstone heading toward Windigo is all downhill and very easy hiking. Again, the rain prevented much looking around or picture-taking, and we basically hiked full-blast all the way to Washington Creek Campground. We arrived at 6 pm. We passed the group campground, which was shockingly loud. Kids were screaming, and we could hear people jumping into water, splashing and yelling. We would discover later that a school group was spending a week there. We followed the path down into the campground itself, and wound through the woods past all of the campsites, finally stopping at the very last one: Shelter #1. We had a nice view of the creek, but we were mostly concerned with getting out of our wet clothes and checking the contents of our backpacks to make sure nothing had been soaked. The covers that were made for our backpacks had done nothing to prevent water from getting inside, but we had also used garbage bags on the insides of our packs as extra protection, and all of the important things were safe. After 5 ½ hours of hiking in the rain, our rain gear had not proven very effective. We were both soaking wet. Our boots performed well considering the length of time we were in the rain, but they were still a bit wet inside. We hung our wet clothes inside the shelter, dried off, changed into warm clothes, and made dinner. We obviously weren't going to find dry wood for the twig-burning stove, and in order to conserve the small amount of fuel we had, we ate one of our cold-prep meals: Kickin' Chicken Hot Wings Wraps by Pack-it Gourmet. It rehydrated in 15 minutes with cold water and was a perfect, filling dinner. It stopped raining shortly after we arrived at Washington Creek, but the thick fog remained. Although the creek was right there, the water wasn't very easy to access, so we walked to Windigo, which is about 10 minutes away, to get potable water from the spigot near the dock. We felt bad about skipping Lake Desor, but we were glad to be in a shelter and in a position to air out all of our wet clothing and gear after a full day of hiking in the rain. It got dark early that night due to the lack of sunshine and persistent fog. We turned in at 9 pm and decided to play the following day by ear depending on what the weather chose to do. I could not fall asleep; my legs felt crazy. They tingled and were very restless, jerking around from time to time of their own accord. Though I had felt really good physically throughout the day, I think the long day of hiking much faster than I normally do in determination to get through the rain and arrive at our destination as quickly as possible had caught up with me. Something big got into the creek outside our shelter just after we went to bed, and we listened to it swimming around in the dark. We were both too tired to get up and try shining our headlamps outside to see for sure, but it was obviously a moose. It is common to see them along Washington Creek, and we hoped more would be around the following morning. To be continued in Day 5: ...? You caught my attention by mentioning the locomotive ruins at Island Mine. I can't find anything about them (your site is already near the top google search for "island mine locomotive"). Do you know anything more about it? Ah, I see -- now that I look, that's what is usually called a "locomotive-style boiler". There are lots of them scattered throughout the copper country woods. :) One of the most spectacular ones is downhill from the Escarpment Trail, near lake of the clouds. Thank you for making time to post. Twenty years ago, our son & I did an identical route (seaplane to Windigo; Siskiwit & Huginnin loops). We had been to the Rock Harbor area & decided to check out the west end. Your blog brings back fond memories.